Nike Nationals — Southlake Running Co.
Southlake Cross Country Headed to Nike Cross Nationals Again. Coming into this Nike South Regional Qualifier, the Carroll girls were coming off a third place finish at the state meet and needed a strong performance to get an automatic bid to NXN. With Hebron, Keller, and Carroll all tightly packed coming into the finish, ultimately Carroll would win the race with 68 points with Keller and Hebron in second and third with 82 and 98 points respectively. With history on their side, the Carroll XC Club girls qualified for their 12th Nike Nationals appearance in the now 14 years of the event being held. Keller XC (and possibly Hebron if they are awarded an at-large) will join them in Portland to represent Texas and the South Region at the big dance. The top four at Nike South were of the same group as the UIL State Meet two weeks ago, this time with some teams changing places at the top. 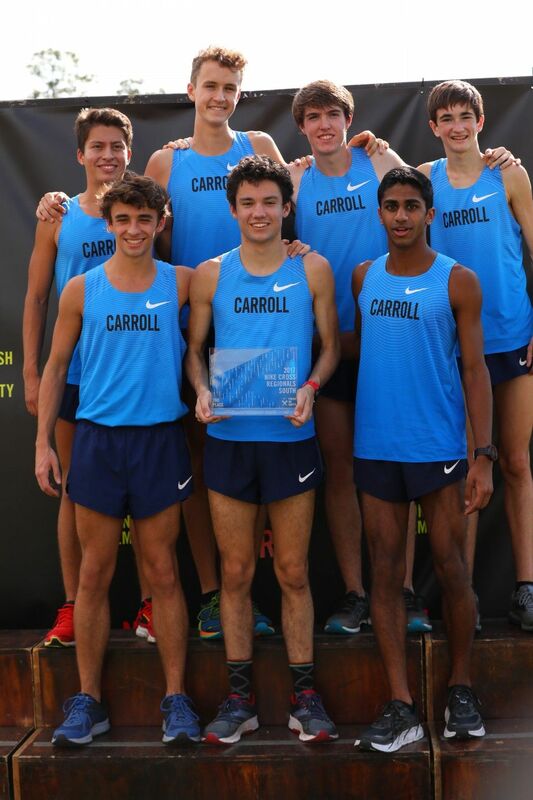 Flower Mound took the Nike South Regional title with 77 points, followed closely by Carroll XC Club at 88 points. El Paso Eastwood and the Woodlands placed third and fourth with 100 and 122 points respectively. This will be the 11th time the Carroll Boys have qualified for the Nike National race in Portland. For both the boys and girls they have qualified for NXN 23 of the 28 possible chances to make Nationals. Below are the Regional and National finishes for each team over the years. Since 2004, the Carroll Girls have finished in the top ten 6 times! The Boys have placed inside the top 20 every year they have competed. Both the Boys and Girls teams have come runner-up at Nationals, and in 2011 & 2012 they were named the National Program of the Year based on the combined finishes of the Boys and Girls.